Having criticized most existing letterform terminology diagrams it seems only fair that I show what I use. These sheets were begun a few years ago for my SVA students but I have never found the time to polish them. Since they don’t yet have any arrows, circles or coloration to indicate exactly what is being described I have added some commentary. Please excuse the missing examples and other glitches. Perhaps this post will spur me to ﬁnish them. 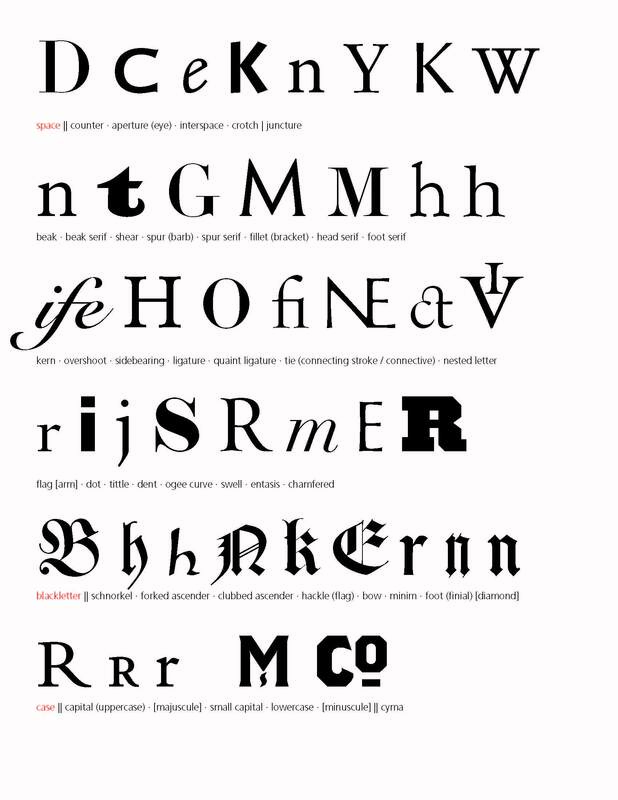 The ﬁrst two sheets are devoted to the terminology of letterforms (italic, script and blackletter as well as roman). I have deliberately chosen a wide variety of typefaces as exemplars. Line 1—shows ﬁve types of apex treatments of A; and two types of crossbar on A. Line 2—contrasts crossbar and cross-stroke; and shows the triangle of t.
Line 3—shows vertex; diagonal (oblique) and vertical stress (also known as bias or axis); slope for script and italic letters; and a comparison of an oblique with a true italic and a backslanted letter. Line 5—a continuation of the anatomical terms: leg and tail (both with more than one meaning). I prefer leg to tail to describe the stroke in R that descends from the bowl. Line 6—more anatomical terms; I tend to use jaw rather than chin to describe the lower right quadrant of G and I call the tiny stroke that sometimes descends from it the beard; in my view the arch is the curved part of letters like h, m and n and the point where the arch meets the vertical stroke (stem to some) is the shoulder; the waist is the middle of a double story letter like B; and branch refers to the arch as it springs from the stem (mainly important for italic and script lowercase letters). Line 1—is concerned with space (within and around letters); I view crotch as the space where two acute strokes meet and juncture (which some call joint) as the actual meeting point. Line 2—deals with serifs (though also see two other sheets below), trying to disambiguate terms that apply to serifs and also to other parts of letters (e.g. beak vs. beak serif or spur vs. spur serif [as in the M]). Line 3—is a miscellany with several terms relating to ligatures and composite letters; these terms are heavily influenced by calligraphy and paleography. Line 4—contains many of the newer terms I have begun to include, even when I don’t ﬁnd them very useful; entasis is an attempt to ﬁnd a term to describe the “waisting” of strokes such as those in Optima; chamfer refers to the diagonally trimmed corners of serifs and curves. Line 5—these are terms unique to blackletter: schnorkel (or elefantenrüssel) is the swash-like stroke that hangs off the front of many fraktur capitals; bow is the curve of letters like E; minim is a short vertical stroke; the rectangular terminals in blackletter are feet not serifs; what I have forgotten to include here is leg to refer to the descending stroke of h which is common. Line 6—case is self evident; cyma is the name for the small stroke, often wavy, that serves as an underscore in old-fashioned abbreviations. It comes from signwriting. 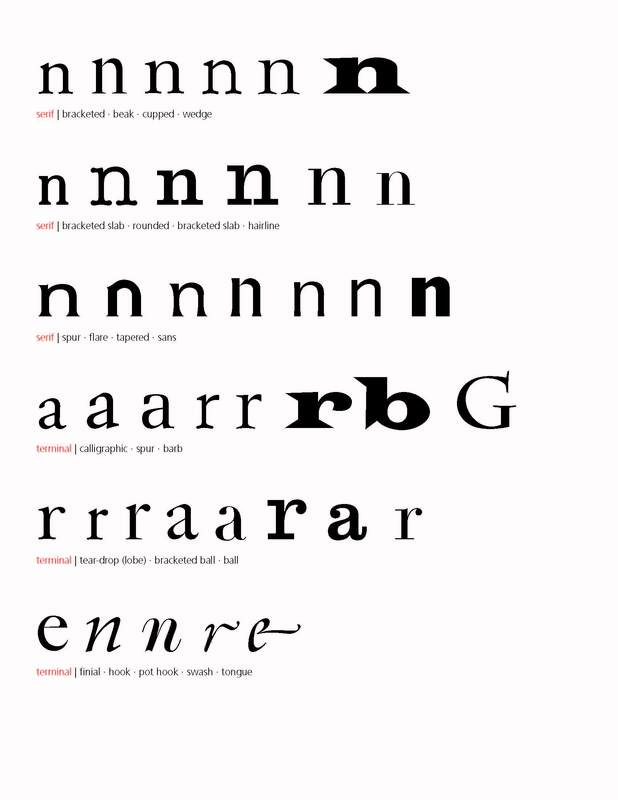 This sheet aims to list the basic decorative approaches that exist in type. Line 1—there is much disagreement over contour vs. outline with some preferring contour to describe a letter that has no interior and outline to describe a line that surrounds a letter; likewise it is often hard to tell where incised becomes open or shaded. Handtooled is a term that comes from the practice of creating decorative types by gouging a line in the thick strokes of already cast type. It is used indiscriminately. Line 2—three versions of letters in perspective are shown. Line 4—several terms are not illustrated: pictorial refers to a letter that is made from people, animals, architecture, etc., while historiated refers to a letter that contains a narrative scene. These are most common in initial letters. Floriated refers to a letter that has plant-like aspects to it. Line 5—some typefaces are initials (capitals only). They are distinct from titling faces. 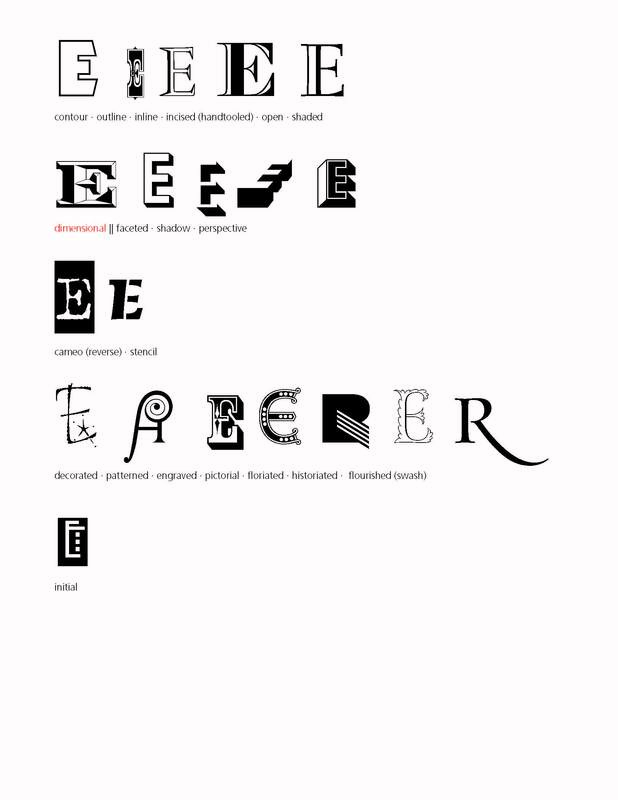 This sheet and the next are an attempt to enumerate and illustrate the many types of serifs and terminals that exist both within and in typefaces. Line 1—the ﬁrst two are bracketed; no. 3 is cupped; no. 4 is wedge; and no. 5 bifurcated. Line 2—the fourth N should be labeled slab; two examples of hairline serif are shown because students often misunderstand a hairline as a slab when the letter is enlarged. Hairline is a relative term. It needs to be seen in comparison to the thick strokes of a letter. Line 3—the ﬁrst two are spur; the next three show the subtle differences that exist between flare and tapered strokes; and the ﬁnal two letters are sans serif for comparison. Line 5—follows the same format as N.
Line 6—follows the same format at N.
Types of serifs and terminals (lowercase). Line 1—many lowercase letters have serifs at the top of stems that differ in form from those at the bottom of their stems or from those in capitals. This line focuses on them as they evolved historically from Venetian Oldstyle to Neoclassical. Line 2—this is like the capital N.
Line 3—this is like the capital N.
Line 4—this is an attempt to go beyond the choice of lobe or ball as terminals; barb refers to both b and G.
Line 5—this tries to show the difference between a lobe terminal and a ball terminal; there are shadings in between. Line 6—ﬁnial is a general term for a terminal; hook and pot hook differentiate italics that accompany oldstyle romans and those that accompany neoclassical types. I prefer to use the calligraphic terms entry stroke and exit stroke for the former. 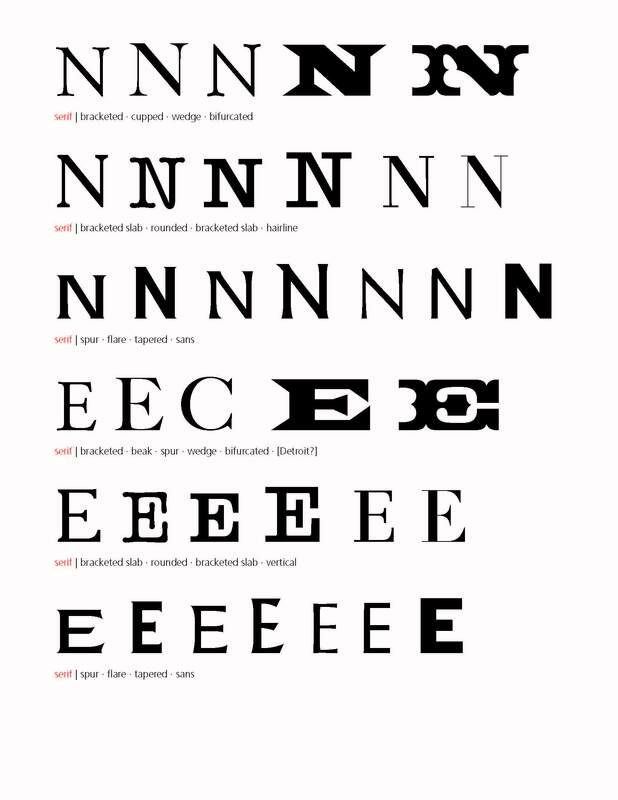 Tongue is a term unique to the chancery italic e.
This sheet makes a stab at organizing the various confusing terms used to designate the weight and width of typefaces. The terms in red are the ones illustrated. It is not complete as it is missing catalogue among the weight options. 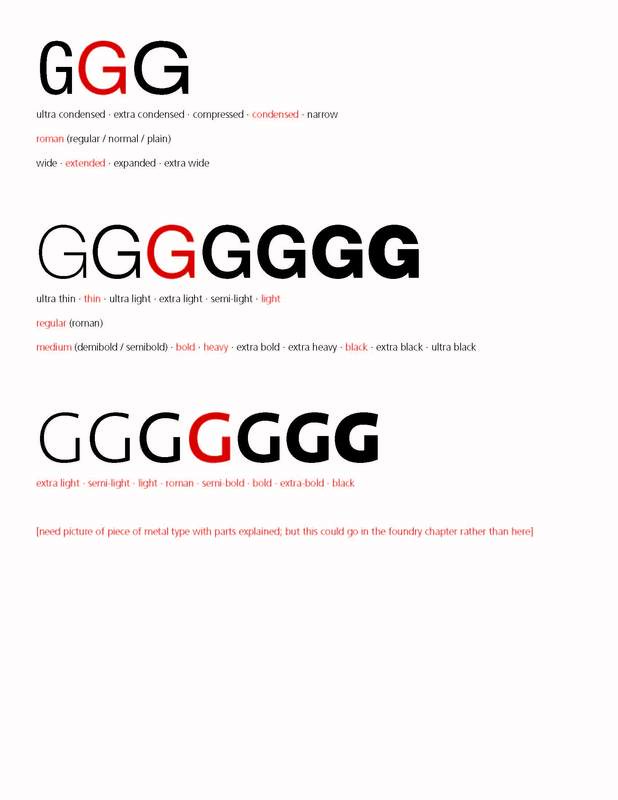 The typefaces used are Neue Helvetica and Thesans. Some day I will ﬁnish these sheets. Maybe even turn them into letterpress-printed posters with glitter.